The sad truth to this question is that many people do not even know that Honduras exists. But, there are several outstanding products that make Honduras famous. So what is Honduras famous for? The quality of Honduran coffee is outstanding. Honduras is now the fifth World producer of coffee! This is quite a feat for a small country. Best of all, it is not quantity, but quality that makes Honduras coffee famous! Honduran coffee is mostly high altitude, 100% Arabica coffee. It is produced by small landowners who take pride in their coffee estates and compete between each other to produce the best coffee. Demand for Honduran coffee has grown over the years, and even surpassed the that of countries such as Guatemala and Costa Rica. Indeed, quality coffee is one of the top things that Honduras is famous for! At the beginning of the twentieth century, Honduras became the Worlds largest producer and exporter of bananas. As a matter of fact, the term “Banana Republic” was coined in Honduras. US author Porter Sydney spent some time in Honduras and wrote his novel “Cabbages and Kings” during his life in Trujillo. Although Honduras is no longer the Worlds largest banana producer, it still produces and exports many bananas. The development of the Caribbean Coast of Honduras came to be thanks to banana companies. Today, cities like Tela and La Ceiba and San Pedro Sula are important cities that grew during the banana days. They have a strong US influence and English is widely spoken through out them. Honduras is on the south eastern end of the Mayan World. There are several Mayan archaeological sites in the Department of Copan, in Western Honduras. By far the most outstanding is the Copan Archaeological site. 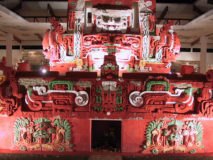 This site boasts the most elaborate high relief sculptures in the Mayan World. It is also the most studied Mayan archaeological site, with over 100 years of continuous study. The longest hieroglyphic text in the Maya World can be seen in Copan. However, you will need to be an outstanding epigraphist to read it and understand it! You can, however, hire a guide that will tell you what it says! 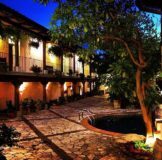 There is a total of four museums in Copan! From the magnificent Museum of Maya Sculpture, where you will see some of the most unique Copan sculptures to the Casa Kinich children´s interactive museum, there is museum for every taste and interest! 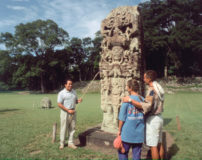 Scholars claim that the intricate sculpture you see in Copan is the influence of Lenca artists. The Lenca are the largest local ethnic group in Honduras. They live in the Western Highlands of Honduras. You can see them by visiting the Lenca Route between Santa Rosa de Copan, Gracias and La Esperanza. The site happens to be next to the charming colonial town of Copan Ruinas. There, you will find many boutique hotels, gourmet restaurants, eclectic cafes and pleasant bars. In addition, a magnificent nature bird park, Macaw Mountain, will allow you to interact with local birds, such as the native macaws, parrots and toucans that thrive in Honduras. A great natural spa, with hot springs is a short drive away. The ride, a scenic mountain drive, takes you through high altitude coffee plantations. The Jaguar Luna Spa offers ideal conditions to relax, soothe your body and rejuvenate your soul! The Bay Islands of Honduras are the southern end of the what we call the Mesoamerican Barrier Reef. This reef follows the coastline of the Yucatan peninsula in Mexico, through Belize and into Honduras. In size, it is the second longest in the World, after the Great Barrier Reef in Australia. However, it is far more bio diverse. According to the Healthy Reef Organization, the Honduras reefs are the healthiest in the Caribbean! This means that you will be hard pressed to find better diving conditions anywhere in the World! Indeed, the Bay Islands of Honduras, including Utila, Guanaja and Roatan offer outstanding diving. Honduras is famous for its great reefs in the Bay Islands! Another thing that makes Honduras famous are the frequent whale shark sightings around the island of Utila. It turns out that you can see this gentle giant regularly around the island. It is quite a spectacle to find yourself in the company of the largest fish in the world! You can contact one of the many dive shops in Utila to arrange for a dive to follow the quest of seeing a whale shark! The islands where once the home of pirates and buccaneers. They were part of the British Colonial Empire in the Caribbean. 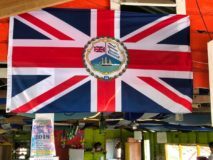 Therefore, they have a strong British heritage that includes their very own Bay Islands flag! 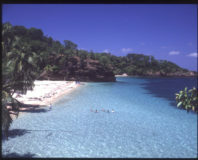 English is widely spoken, and the islands have become an important tourist destination. Roatan, Honduras has become one of the fastest growing cruise ship ports of call in the Caribbean. 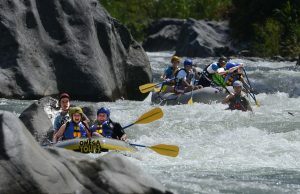 Experiencing white water rafting in Honduras at the Cangrejal River. Photo courtesy of Omega Tours. Honduras has almost 100 national parks! Almost 40% of its territory is protected by law. This is almost the size of the entire country of Costa Rica! Although many of these areas are within the Moskitia region, and therefore hard to get, others are very accessible! The department of Atlantida, on the Caribbean Coast boasts a total of 8 protected areas. 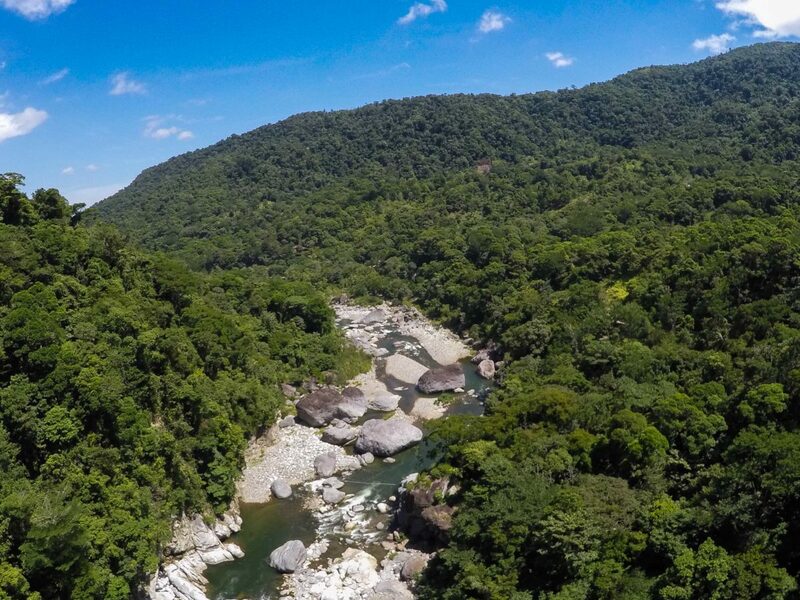 The Cangrejal River Valley is part of this system and has become the adventure and nature hub in Honduras. Access is easy, and best of all, it is very close to the Bay Islands of Honduras! If you are into nature, plan on visiting one of the National Parks in Honduras. You will be happy you did! Now You Know What Honduras is Famous for! As you can see, there are many good reasons to make Honduras famous for! Unfortunately, it is also famous for a bad reason. During the period between 2007 and 2015, San Pedro Sula was the Murder Capital of the World! This was because organized crime and drug cartels where fighting over territory. A strong action by the local government, with help from friendly countries has reversed this. As a matter of fact, Honduras has become a case study of how to regain control of the big cities. The fight against the Central American Gangs and drug cartels have been successful. Many countries issue travel warnings to their citizens against travel to Honduras. The truth is that tourists are not the target of these gangs. There are fewer attacks against tourists in Honduras than most other countries in the World. These are rare and easily avoided by not wandering off the usual travel destinations in the country. To help you understand the reality of travel in Honduras, I suggest you read our Honduras Travel Advisory for 2019.